Signed and dated l.r., brown paint "T Sidney Cooper RA/1877". CLM, Sydney Morning Herald , 'Our art gallery [letter]', Sydney, 23 Oct 1884, p 4. Merryn Gates, Strike a pose: Hunter art.1 art tourist 2004 , 'Putting you in the picture', Lake Macquarie, 2004, pp 16–18, col illus p 17. De Libra, Sydney Mail , 'New treasures at the Art Gallery’, Sydney, 27 Dec 1884, p 1317. W J Loftie, Magazine of Art , 'Art in Australia', London, 1886, pp 174–75: p 175. Official awards: Sydney International exhibition 1879 , Sydney, [circa 1880], p 327. Ninth annual report of the New South Wales Academy of Art [for the year 1879–80] , Sydney, 1880, p 6. 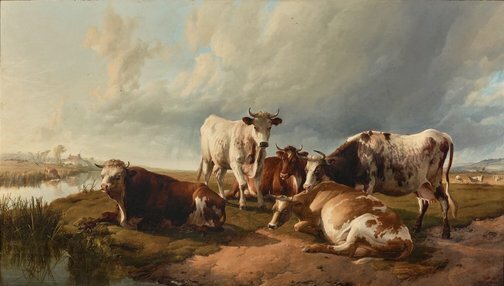 As 'Minster Marshes – Cattle’. Sydney Mail , ‘New South Wales Art Gallery ’, Sydney, 16 Oct 1880, p 740. Art Journal , 'The Sydney exhibition', London, 1880, p 127. Official Record of the Sydney International Exhibition 1879 , Sydney, 1881, pp 453, 478. Catalogue descriptive and critical of the Art Gallery with Sydney art notes , Sydney, 1883, p 20. Not an official publication. Catalogue of the Art Gallery of New South Wales ... published by sanction of the trustees , Sydney, 1883, p 7, no 12, illus p 7 (sketch by E L Montefiore). British painting 1800–1990 in Australian and New Zealand public collections , Sydney, 1997, p 69, no 448. National Art Gallery of NSW illustrated catalogue , Sydney, 1906, p 50, no 131. Picture study in schools – records of the Education Society, no 7 , Sydney, 1913, pp 53–54, illus p 53. National Art Gallery of NSW illustrated catalogue , Sydney, 1917, p 44, no 120. National Art Gallery of NSW: illustrated catalogue , Sydney, 1924, p 33, no 95. Thomas Sidney Cooper, CVO, RA, 1803–1902 , Leigh-on-Sea, 1976, p 68, no 235. Sydney International Exhibition 1879: An exhibition celebrating the centenary of the Sydney International Exhibition , Sydney, 1979, p 38, illus p 28 (as part of hang). Art Gallery of New South Wales annual report 2004 [for the year ended 30 June 2004] , Sydney, 2004, p 71. Loan. Descriptive catalogue of pictures, &c., in the art gallery of the International Exhibition Sydney, 1879–80 , Sydney, [circa 1879], p 13, no 128. 128. "Minster Marshes, East Kent" - T. Sidney Cooper, R.A. One of the gems of the gallery. Drawing, colour, light, atmosphere, and general arrangements, are masterly in the extreme. Catalogue of the National Art Gallery of New South Wales , Sydney, 1884, p 7, no 12, illus p 7 (sketch by E L Montefiore). Art Gallery of New South Wales catalogue of British paintings , Sydney, 1987, p 41, illus p 41. Sydney International Exhibition: Official catalogue of exhibits , Sydney, 1879, p 453. Sydney International Exhibition 1879: official catalogue of the British section , London, , p 9, no 56. Descriptive hand-book of pictures, &c, in the art gallery of the International Exhibition Sydney, 1879–80 , Sydney, [circa 1879], p 15, no 128. 2nd ed.